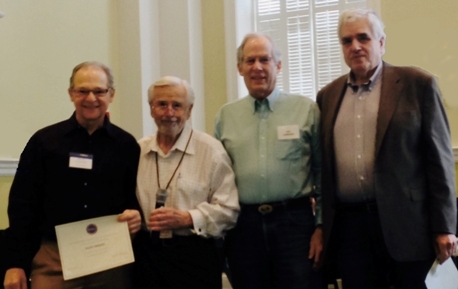 OUTSTANDING SERVICE AWARDS | Retired Men's Association of Greenwich, Inc. 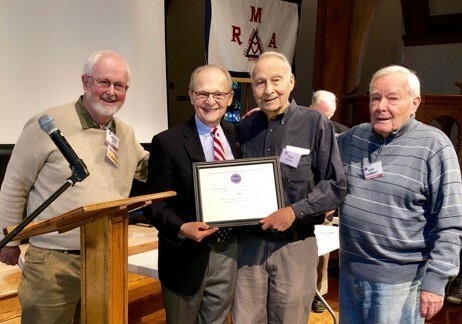 The Outstanding Service Award was established by the RMA Board on September 1, 1984 for the purpose of recognizing any member or non-member who has made outstanding contributions to enhance the presence, image, goals and well-being of the RMA over a number of years. Ted is a classic recipient of this award. He is a quiet doer. 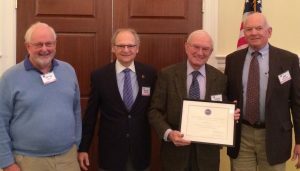 The selection committee, composed of the past three RMA Presidents, felt that Ted’s initiatives in the area of organizing and running the outdoor summer tennis programs alone merits his being an honoree. But Ted has given much more to the organization including demonstrating his technical skills behind the RMA video camera. Ted is modest about what he has done and what he does. Even after illness set him back from playing racket sports, he continued to contribute to the camera work and make his presence known at meetings. Steve Myers grew up in Stamford. 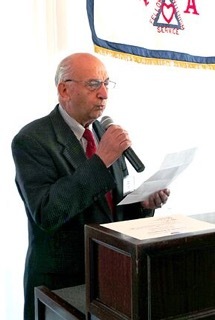 He graduated from RPI in 1958 with a Bachelors degree in Physics and worked as a Perkin Elmer scientist for 25 years. He obtained a PhD in Physics from New York University in 1976 and later developed an instrument to analyze DNA. Active in the Nuclear Freeze movement in the 1980s, he was elected president of the Greenwich Forum on War and Peace. Steve later volunteered at Greenwich High helping students develop a wide variety of instruments in order to compete in national and international science competitions. Steve serves on the Science Committee and the Board of Directors of the Bruce Museum. Within the RMA, Steve has organized numerous programs on scientific subjects including his talk on NASA’s Mars Rover “Curiosity” and a joint talk on “Proving Einstein Right on Gravity Waves and Relativity Theory”. 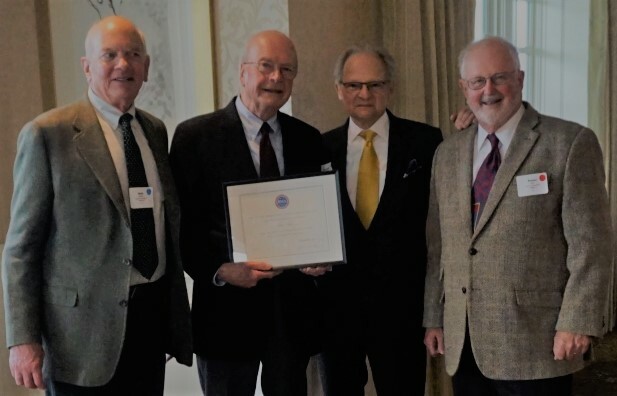 He has sponsored speakers from the Lamont-Doherty Laboratories, arranged two RMA Special Events trips to the Lamont labs and sponsored numerous science presentation at the RMA. He has been active behind the scenes editing videos of RMA speakers each week and as a member of the technical team for our meetings. Mike grew up in Northern California. He graduated from Saint Ignatius College Preparatory in San Francisco in 1955 and then went on to obtain degrees in Political Science from Santa Clara University and in International Marketing from the Thunderbird School of Global Management. Mike also attended the University of Grenoble in France. His professional career began with stints at Pan American World Airways in San Francisco and Radio Menag in Marseille, France. In late 1964, Mike joined Texaco where he had a 35 years career, 22 years of which were spent abroad beginning with 15 years in French speaking West African countries and followed by 7 years in London. He held various downstream marketing positions in Africa followed by managerial assignments with Texaco’s International Sales Department in both London and in the United States selling jet fuel to airlines throughout the world. Mike retired from Texaco in 1999. In retirement, Mike has been active in various volunteer activities. He is a past president of the RMA with membership going back to 2000 and 10 years service on the RMA board. Mike also is a past president of Call-A-Ride and to date has been a driver for 17 years with that organization. He volunteered for 13 years at Greenwich Hospital and for the past 18 seasons has been a backstage tour guide at the Metropolitan Opera. Mike and his wife Susan have been married for 53 years and have two children and four grandchildren. 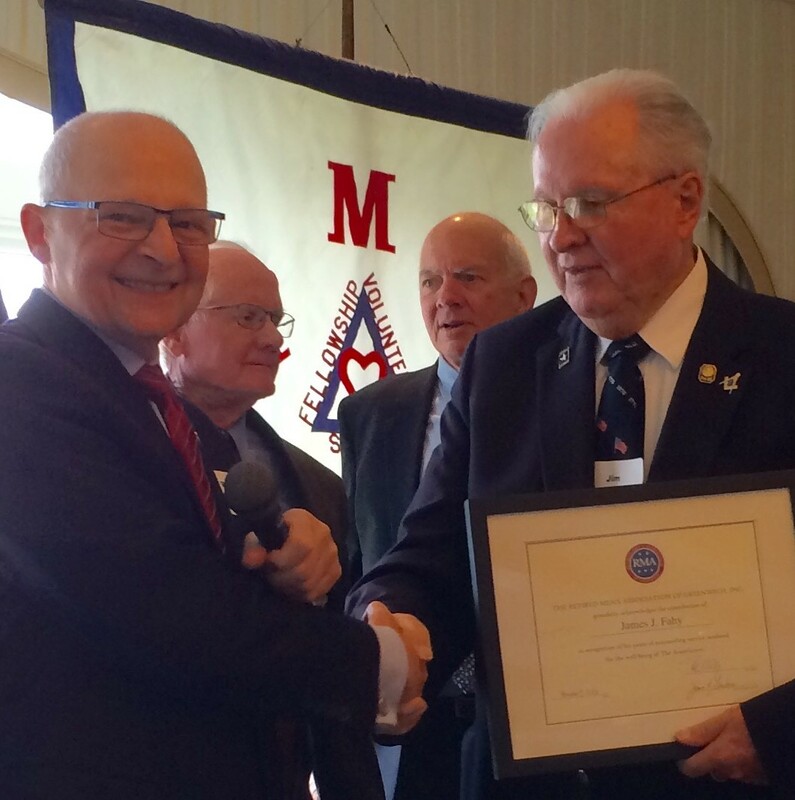 In recognition of Jim Fahy’s contributions to the RMA for over ten years. Jim is and has been the most prominent figure at RMA’s Annual Picnic, Annual Dinner and weekly meetings for over ten years. He is usually the first person we see waiting to greet us and he takes charge of all activities. His countenance assures us that our meetings are run in an orderly manner. Jim’s presence on the Board Of Directors was a welcomed addition to the many other responsibilities that adds to the RMA’s success.